Farnivane, in the parish of Templemartin, was the site of the first Catholic Church built after the Reformation (circa 1720). It was situated about 100 yards to the south of the existing Catholic Church. The eminent historian Bro Allen, a native of Greenhill, said it was on the site of the present cemetery. This was probably the church referred to in the 1731 Report on State of Popery, “In this parish there is one popish school; one mass house and that built since the first year of the reign of George 1; and one popish priest residence”. The present church of St. Martin was erected in 1821 by the Lordan family builders and road contractors who resided in Mossgrove. The estate records of the Duke of Devonshire, known as the Lismore Papers, now in the National Library have under the heading ‘Subscriptions and Donations’ makes a reference to Farnivane Church. It says “paid James Splaine to assist in erecting RC Chapel in the parish of Templemartin £15 (AD 1821)”. Fr. Patrick Murphy was the parish priest at the time and he was also first to keep parish records in 1833, he died in 1835 and is buried in his family grave in Knockavilla old cemetery. 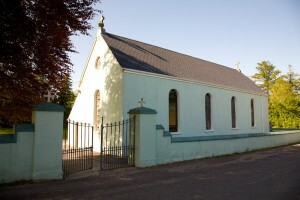 The Church of St. Martin was reconstructed and renovated in 1882-83, and in 1884 the Sacrament of Confirmation was administered to 160 children in Farnivane by the Bishop of Cork Dr. William Delaney. The parish priest at the time was Rev Jeremiah Cummins and the curate was Fr. Denis O’Mahony. The cemetery in Farnivane was blessed and opened in 1950, the first interment taking place the following year when Redmond (Red) Walsh, Curravordy, was interred. The land for the cemetery was bought for a nominal sum from Mr. Giles, Roughgrove, and a lot of voluntary labour went into the laying out of the ground. The then curate, Fr. Michael O’Riordan, was the architect and chief motivator behind this very big project at the time. The PP was Fr. Richard Cronin. Now over sixty years on it is a very well kept cemetery and a credit to the vision of the clergy and the laity who were so progressive in difficult times.